2.6.11 WEAVER, JOSEPH MANFRED 1846-? 2.6.12 WILMARTH, JOHN CRANE 1842-? St. James merged here, 06/16/2018. Ezekiel Bates Lodge A. F. &. A. M., Attleboro, Mass. is an excellent example of Masonic prosperity. Beginning its career in 1870 as an off-shoot of Bristol Lodge of North Attleboro, it has increased in membership and influence and is now the second largest lodge in the 23d Masonic District in which it is situated. Its beginning was small but the brethren who were its founders were earnest and zealous in their devotion to the cause. Before any formal organization was made it had been the custom of a number of the brethren residing in this town to get together and rehearse the lectures and work of the degrees as a preparation for the organization of a lodge; to facilitate this business they occupied a room in the upper part of a shop where they met with frequency. This place was soon found too small to accommodate those who were interested and a larger room was found when it was decided to apply to the Grand Lodge for a dispensation to open a lodge: the dispensation was soon obtained and one of the brethren, Brother D. H. Smith was appointed the first Worshipful Master. Prosperity attended them and a hall was secured for their better accommodation in which their meetings were held, a charter soon after was granted by the Grand Lodge bearing date of April 9, 5970. Membership rapidly increased and another and larger hall was occupied which served their wants for about 29 years when increasing membership warranted another and more important move which was made last October when the lodge moved to quarters specially designed for their use in the new Bronson building. These new quarters were dedicated by the Grand Master and officers of the Grand Lodge with imposing ceremony in the presence of a large assembly of brethren and ladies. A banquet, followed by a reception were the concluding features of the occasion. The new Masonic quarters are the meeting places for Ezekiel Bates Lodge, Bristol Commandery of Knights Templars; Attleboro Council of Royal and Select Masters; King Hiram Royal Arch Chapter and Hope Chapter of the Eastern Star. The rooms for the lodges are of the two top floors of the new block. On the top floor is the kitchen and banquet hall. The kitchen is fully equipped in every particular and the banquet hall is one of the finest in the state and is large enough to seat 500 persons. The large meeting hall is on the next floor below and is the handsomest hall in the Attleboros. The walls are finished in a dull, dark yellow and cream and the mahogany furniture and rich, red carpet contrast handsomely with the green plush upholstering. A new pipe organ especially built for this lodge is placed in this hall. A smaller hall finished entirely in a dull red is provided for smaller meetings. On the same floor is the armory of the Commandery, containing glass lockers for the uniforms. The other rooms include an officers' room, several smaller parlors and smoking rooms. 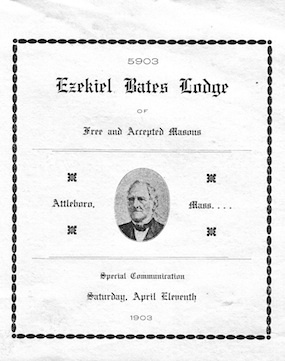 Ezekiel Bates Lodge, Attleboro, Mass., Chartered April 9th, 5870. Thus reads the Seal of this Lodge, the official stamp of our organization. (It is not clear w)hether this date, October 16th, can be called the proper date on which to celebrate the Silver Anniversary of this Lodge or not. It occurred to the minds of some of the members that the Year 1895 completed the twenty-fifth year of our existence. And as the Charter granted bore the date of April 9th, and the Lodge was not constituted until September, which is near our annual meeting, it was suggested and finally decided to hold some sort of meeting that would in some measure fittingly recognize the occasion, and at the same time institute a precedent that should be continued forever hereafter, viz., an effort to make the annual meeting a time to be look forward to, when every member would be expected to be present, act on the yearly reports, elect officers, and give the Lodge a good send-off for the new year. The History of Freemasonry in Attleboro dates back to the year 1812 when Bristol (now located in North Attleboro), the Mother Lodge, moved here from Norton, Mass. But let us go back still further, June 26, 1797, in the Town of Norton, Bristol Lodge was organized and held its first meeting, there being nine (9) members and one visitor present. The record does not say where they met but the record of July 19th, the same year, says the lodge was opened at Samuel Fay's house, which together with a section in the By-Laws under which they worked that reads "That the Lodge shall meet at such a place as the majority of the members present think fit" on the evening of the first Monday of every month; "if there is an equal division as to the place, the Master shall decide;" (it) looks very much as if they met around among the members in their different homes. Some of the By-Laws under which our fathers worked seem peculiar, some of which are as follows. The By-Laws fixed the membership at forty, no more could be added except by vote. Concerning the meetings, it says "and that each member shall appear decently dressed each night." Another, "No liquor shall be brought into the Lodge Room except by order of the Worshipful Master." And another, "No member of visitor shall do any fighting or quarreling or use and profane or opprobrious language during the Lodge meeting or within thirty minutes after closing; in case of a disobeyment of the rule, the member shall be called up by name and publicly reprimanded by the Master; for second offence, he or they shall be expelled." The Annual Meeting and Election of Officers was held the first Monday in June. The Stewards were required to hand in at the Annual Meeting an Inventory of Utensils and Furniture which, if accepted, was handed over to the new Stewards. Notices of Meeting were either given out from one meeting to another or they were delivered by the Tyler at the Master's order. "Any member proposing a candidate shall be held responsible for the fee, and if he (the candidate) fails to take the degree after a clear ballot, the member shall pay five dollars for the Lodge Chest." "On ballot being clear, candidate shall take first degree, and the second when the Master thinks him deserving, and must be examined before taking the Third, and if raised at a special meeting, the candidate must pay the fee and expense of meeting, and I am informed by older ones that most of the raisings occurred on special meetings and the candidate had to settle. Fees: First, $10.00; Second, $3.00; Third, $4.00 and expenses. So much for the By-Laws. On the 14th of December, 1797, the record says that the Lodge was opened in Taunton and received a petition. They seemed to have a very large jurisdiction. Petitions were received from Taunton, Walpole. Rehoboth and other places. It is very interesting to look through the old records and trace the doings of our early Brethren. It has been the privilege of the writer (through the kindness of W. Bro. E. P. Price, Cashier, Attleborough National Bank, in whose vaults the old records are kept) to look them over although for lack of time in rather a hurried manner. They (the members) were apparently free and easy-going in their methods but careful as to the spirit of the Institution. Nothing of great importance occurred while the Lodge was in Norton (except that one time they granted a Charter to petitioners from Rehoboth to hold a Lodge in that Town.) The Lodge (Bristol) was constituted June 20th, 5798 by Josiah Bartlett, Grand Master. At a meeting held March 6th, 1800, it was voted "No refreshments to be brought in in the future except wine and spirit." The writer has been led to wonder what they were in the habit of having previous to this vote. Without any reason given, at a meeting held December 5th, 1811, agreeable to a petition, voted "To move the Lodge to Attleboro, East Precinct," the Grand Lodge having amended the Charter and given permission so to do. Mathias Richardson, Junior, was Worshipful Master. And at the same, it was voted to increase membership to 80. The last meeting held in Norton was on January 23rd, 1812, at which time the Master called the next meeting to meet in the Franklin School House, Attleboro East Precinct (which site, I believe, is now the front yard of the Second Congregational Church, to right as you approach the main entrance), Thursday next preceding the full moon at one o'clock P.M., which appears from the records to have been a special meeting for the purpose of receiving a petition, fee $15.00, K. Daggett, Secretary. February 27th, 1812, a committee consisting of Jobel Ingraham and Amos Sweet were chosen to see about a lot and to build a hall. There is no record of this committee, but December 16th, same year, at a regular meeting, it was voted to have a committee for drawing up plans for a hall. William Fisher and Noah Claflin were appointed on this committee and at the next regular meeting, this committee was discharged and another committee consisting of the same men with the Master was chosen with full power to "act as agents for the Lodge and build a building such as they think best." Nothing further in the record is heard from them. February 11th, 1813, chose another committee to arrange with Benjamin Balkum to build them a suitable hall and let (it to) them for five hundred dollars for fourteen years. March 5th, 1813, Samuel Carpenter, father of S. F. Carpenter, was proposed as a candidate, fee $15.00, a raise from $10.00. He was initiated March 11th, crafter April 15th, fee $3.00, and raised May 13th at 2 o'clock, P.M., which appears to have been a special meeting. At the next annual meeting, he was appointed Tyler, served one year and appears next as Treasurer in 1818 and 1819, and at various other times up to 1830. Nothing more appears of him as the record book from 1832 to 1871 can up to this time not be found. At a meeting held August 13th, 1829, voted: "That Elihu Daggett personally present a petition to the Grand Lodge to have erased from the Charter the clause East Precinct, no reasons given. March 14th, 1830, Willard Blackinton in the chair, a communication was received from the Grand Lodge complying with the above request, giving the Lodge the privilege of "meeting as their best interests require." May 6, 1830, voted to move to Farnum's Hall. It is supposed by many that this vote was the action by which the Lodge was moved to its present location, North Attleboro. Nothing appeared in the records to explain why they moved but it is natural to suppose that as North Attleboro was then the most important part of the Town, they expected to gain in members by the change. It is impossible to further pursue the Lodge's action because of the missing link before referred to. We know, however, that early in the Thirties the great anti-masonic move swept the country and that the Charter of Bristol Lodge was returned to the Grand Lodge, where it lay for many years and Masonry took a long rest as it appeared on the surface. The next we hear of Bristol Lodge comes in the form of the restoration of the Charter to eight brethren, December 13th, 1854 - Willard Robinson, S. O. Draper, Willard Blackinton, Rufus P. Barrows, Ephrium Deon, Daniel Babcock, Noah Claflin and Edward Richardson. For some reason it was not taken up; or if it was, it was returned to the Grand Lodge without being used until September 14, 1859, when the Grand Lodge again restored it to the same Brethren. Up to the year 1868, Attleboro Precinct, as it was then called, had grown to be an important part of the Town, having gradually increased in numbers and in the business line was of much importance and many of the citizens desiring to unite themselves with the Fraternity, worked their way Northward until quite a number were members of Bristol Lodge. About this time (1868) a few zealous members of Bristol Lodge, North Attleboro, began to interest themselves in a movement looking towards the formation of a Masonic Lodge in the East part of the town. Among the first movers in the matter was our well-known Brother, A. R. Crosby, who then occupied a small one-story building situated on the north side of Park Street, where Briggs Block now stands, known at the time as "Uncle Tom's Cabin", wherein he followed his daily round of business. In the attic of said building, whose only approach was by a ladder, through a scuttle, night after night, the business of the day over, at first two or three and as the interest increased several others, met and studied up the work and laid the foundations of the Lodge that was so soon to follow. In the meantime, arrangements were being made for more commodious quarters. The building now known as Dean's Block, Park Street, was in process of erection and arrangements were made with Mr. Dean to extend his plans by adding one story, thereby making a hall for our accommodation. The hall was completed and furnished in due time and Ezekiel Bates Lodge moved into its new and finely furnished quarters. At the expiration of a five years' lease, the question of procuring a still larger hall was considered and it became evident that a change would be made as soon as a proper place could be procured, which began to appear at an early day in the form of a brick block that was then in contemplation by our Bro. James H. Sturdy. In process of time the building was erected, a fine hall with all its appointments and elegantly furnished, and again Ezekiel Bates moved into its new quarters, which they occupy at this time. In the winter of 1882, it was evident that something must be done to revive the lagging interest and change the current (state) of affairs or ruin might come. Several of the members of the Lodge called a quiet meeting for conference, the result of which was the proposal that the Lodge hold a big Fair. The proposition was accepted and at the next regular meeting of the Lodge, the matter was presented and after a full discussion it was voted to hold a Fair. A large committee was chosen to whom was intrusted the entire management of the affair, and "On to Victory" was the cry. One of our members, Bro. J. M. Bates, just at this time was completing his new Watch Case Factory, three stories with basement, 200 x 35 ft., and with his consent it was decided to christen the building by holding an immense Fair, occupying the entire floor space. Electricity was introduced for the first time in the town as the method of lighting the building at the time of the fair (put in as an advertisement by Boston parties). The plans were well laid, much hard work done, and on the evenings of April 17, 18, 19, 1883, was held the largest and most successful Fair ever known in this vicinity. A complete success from A to Z; everybody came from most everywhere and over six thousand dollars ($6,000) was taken in. As before stated in this paper, the original membership at its organization was twenty-four (24) and there has been a steady and gradual growth by additions until the total amounts to one hundred eighty-five (185) losses by death, suspensions, dimitting and one expulsion amount to sixty-one (61), leaving us with a membership today of one hundred twenty-four (124), and one life member, Bro. Everett S. Horton, and four more in sight. Our oldest member is Joabert Sweet, seventy-seven (77) years; the youngest, Rufus Custis Reed, twenty-one (21) years. The oldest Mason is W. Bro. Nehemiah Hicks who was raised in Home Lodge #398, New York State in 1861, who is also sixty-five (65) years of age. We are all growing older - and twenty five years hence? - well, we will all be older. Respectfully submitted, Benjamin P. King. By R.W. Ralph C. Estes. Whenever our attention is directed to the history of Ezekiel Bates Lodge, we inevitably visualize a pair of long legs just disappearing through a scuttle leading to Hie attic of "Uncle Tom's Cabin." These legs, so well known to those of us who had the pleasure of attending the meetings of Ezekiel Bates Lodge ten and more years ago, were attached to the body of the Masonic Daddy of us all. We refer to our dearly beloved Right Worshipful Brother Alfred R. Crosby who, we are delighted to say, is still among us and with us to commemorate the fiftieth anniversary of the Institution of the Lodge which he did so much to organize and foster, and we are sure it must give him much satisfaction to see that institution now grown from twenty-four charter members to over four hundred in the past fifty years. In 1868 Right Worshipful Brother Crosby had his place of business in a small one-story building situated at the corner of Bank and Park Streets in this city where the Smith & Dexter Block, formerly known as the Briggs Block, now stands. This building was known at that time as "Uncle Tom's Cabin," and in its attic, the only approach to which was by a ladder through a scuttle, after the business of the day was over, Right Worshipful Brother Crosby with, at first, two or three others and then more, night after night met and studied and laid the foundations on which Ezekiel Bates Lodge now stands and prospers. In a short time the number interested multiplied so that more spacious quarters were necessary, and rooms were hired in a house at the corner of Bank and Peck Streets. The interest increased and consequently application was made to the Most Worshipful Grand Lodge for Dispensation to form a Lodge, and through the influence of Worshipful Brother Ezekiel Bates, a citizen of Attleboro and a Past Master of theLodge of Saint Andrew, of Boston, the Dispensation was granted, the Lodge formed, and given the name of Ezekiel Bates, its Patron Saint, who unfortunately did not live to see the Lodge Constituted. The records show that on March 30, 1871, the Lodge attended his funeral from Dean's Hall, together with Bristol Lodge and the Lodge of Saint Andrew. A cup presented him by the Lodge of Saint Andrew in 1854 and to Ezekiel Bates Lodge by his son, J. T. Bates in 1900, is on exhibition in the cabinet in our parlor. The Lodge was Constituted on September 6th of the same year and its hall Dedicated in the new Dean Block by the Most Worshipful Grand Lodge, although the Charter bears the date of April 9, 1870, and the first meeting of the Lodge was held on April 13th of that year. Ezekiel Bates Lodge is an offspring of Bristol Lodge, which was organized in 1797 in Norton and moved to Attleboro in 1812, holding its meetings in the Franklin School House, Attleboro East Precinct, which was situated where the Second Congregational Church now is. In 1830 Bristol Lodge moved to North Attleboro, which was then the most important part of the* town, and has since been separated from what was then called East Precinct, which is now the City of Attleboro. For the early history of Masonry in Attleboro we are almost entirely indebted to our late Brother Worshipful Benjamin P. King, who was a Past Master of Ezekiel Bates Lodge and its Secretary for thirty-one years. His sad death occurred less than a year ago, and we all deeply regret that he could not have been spared, at least to have been with us on this occasion and to have written for us the history of the past twenty-five years, as twenty-five years ago he wrote the history of the first quarter of a century of Ezekiel Bates Lodge, which he compiled after a searching investigation of the records of Bristol and Ezekiel Bates Lodges, and from the fund of Masonic history which he himself possessed. Much that is being read to you today is taken verbatim from his history. No one is so well fitted as he would have been to bring this history to date. During all of the last twenty-five years of his life he was the Secretary of the Lodge. Bristol Lodge held its first meeting on June 26, 1797, with nine members and one visitor present. The Lodge met on the evening of the first Monday of each month at such places as the majority of members decided, and if the members were equally divided as to the place to meet, the Master was allowed to decide. Apparently they met at the different homes of the members. Among its By-Laws were some that to us now seem strange and even humorous. We wonder if some of ours will seem as strange and humorous to our descendants one hundred years hence. The membership was fixed at forty and each member was required to appear at the meetings "decently dressed." No liquor was allowed to be brought into the Lodge-room, "except by order of the Worshipful Master": and no member or visitor was allowed "to do any fighting or quarreling or use any profane or opprobrious language during the meeting or within thirty minutes after closing." For the first offense the sentence was a public reprimand by the Master, and for a second offense expulsion. Notices of the meetings were given out from one meeting to another or by delivery by the Tyler at the Master's order. Any member proposing a candidate was held responsible for the fee, and if the candidate failed to take the degree after a clear ballot, the member was obliged to pay five dollars for the Lodge chest. If the candidate was elected, he took his first degree and the second one if the Master thought him deserving, but he had to be examined before taking the third, and if the third degree was on a special meeting, the candidate had to pay the fee and the expense of the meeting; tradition informs us that most third degrees were on special meetings. The fees were ten dollars for the first degree, three dollars for the second, and four dollars and expenses for the third. Bristol Lodge was Constituted June 20, A.L, 5798, by Josiah Bartlett, Most Worshipful Grand Master. At a meeting in 1880 it was voted that "no refreshments be brought in in the future, excepting wine and spirits," but the record is silent as to what the habit had previously been. From 1832 to 1871 there is no record book of Bristol Lodge that can be found, but it will be recalled that in the early thirties the great Anti-Masonic movement swept the country and the Charter was returned to the Grand Lodge. It was restored to eight Brethren in 1854, but apparently was not taken up or was returned to the Grand Lodge without being used until September, 1859, when the Grand Lodge again restored it to the same eight Brethren, and from that time on Bristol Lodge has been gaining in members and influence. 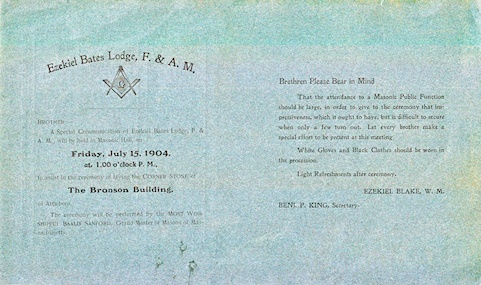 Worshipful Brother King said in his history, "it will soon be time to celebrate its (Bristol Lodge) centennial anniversary," and we find by the records of Ezekiel Bates Lodge that this anniversary was celebrated and that our Right Worshipful Brother Crosby responded to a toast "Our Offspring." As was outlined in the beginning, about 1868 the wise men came out of the East to watch over the birth of Ezekiel Bates Lodge; our late Right Worshipful Brother Daniel H. Smith, whom many of us remember and dearly loved, was appointed its first Master. We wish that time would allow us to speak more fully of some of our early Brethren, who mostly came from Bristol Lodge, for mi analysis of the character and example of these twenty-four charter members would be an inspiration to us all. Five of them are still living, as is also Brother George F. Ide, who missed being a charter member only because through an oversight he did not sign the application for the Charter, but he paid dues from the beginning and for two years before it was discovered he was not a member. Five of the six are still residents of Attleboro, and all are an honor to the communities in which they live. Eight Worshipful Brother Smith was twice Master of Ezekiel Bates Lodge, and before he died gave to the Lodge the sum of one thousand dollars, which is the foundation of a fund which bears his name. Right Worshipful Brother Crosby was the first Senior Warden, and of those now living, Brother John W. Luther was Marshal, John Baxter was Senior Steward, and Orville Balcolm, Sentinel. The Lodge secured new quarters in the Dean Block in 1871, but at the expiration of a five years' lease still larger quarters were necessary, and when it was found that a brick block was being contemplated by our late Brother James H. Sturdy, he was prevailed upon to add another story to the building and the two top floors were leased and, for those times, elegantly furnished, and were occupied until 1905, when the Lodge again feeling the need of more commodious quarters secured the two upper floors of the Bronson Block, in which we now are. The furnishing of the new hall, together with the payment of a tax levied by the Grand Lodge upon the particular Lodges to pay for the Temple in Boston, left Ezekiel Bates Lodge heavily in debt in 1876 when it went into the quarters in Sturdy Block, which is now the Attleboro Savings and Loan Association Building, and although interest was renewed it soon became evident that something ought to be done to relieve the Lodge of its financial burden. The result was that the Brethren organized and, with their slogan "On to victory," held a three days' fair in April, 1883, in the new factory just erected by our late Brother Joseph M. Bates, who very generously gave the use of the factory, which was lighted by electricity, being the first electric lights used in Attleboro; one of our mementos being a framed advertisement of the fair which featured the display of lighting. The fair was an overwhelming success; over six thousand dollars was realized and, after all debts were paid, the net result was a surplus to the Lodge of two thousand six hundred dollars, which was placed in the hands of the Trustees for a permanent investment, and which has grown to several times that amount. Here we might pause to pay tribute to our Trustees, especially to our late Brother Everett S. Horton, who was a member of the Finance Committee for thirty years and a Trustee for twenty-eight years, and the first life member of Ezekiel Bates Lodge. From the time that the Lodge found itself free from debt it has prospered. At the celebration of its twenty-fifth anniversary, Brother Horton was the only life member, but Worshipful Brother King said there are "four more in sight." That number has greatly increased in the last twenty-five years, many following the example of Brother Horton; also, the example set by him as a Trustee has been religiously adhered to by all succeeding Trustees and, although we often hear some scolding, one is indeed valorous who dares make a motion to pry loose any of the funds in their hands. Even the interest from the fund created by life memberships has been left to accumulate, notwithstanding that, theoretically, it should be used for the expenses of the Lodge. In the last twenty-five years probably the most outstanding feature in the history of Ezekiel Bates Lodge is the removal of its quarters in 1905 from Sturdy Block to the Bronson Block. During this quarter of a century we have been honored by the presence of the officers of the Most Worshipful Grand Lodge on four occasions. In 1903 at the laying of the corner-stone of the Second Congregational Church, in 1904 at the laying of the corner-stone of Bronson Building, and in 1905 at the dedication of the new hall in the Bronson Building, at which Most Worshipful Baalis Sanford officiated, and on the present occasion. Right Worshipful Brother Crosby and our late Right Worshipful Brother Edward C. Martin, also officiated as representatives of the Grand Lodge at the laying of the corner-stone of the Episcopal Church in 1900. These two were for many years very active in all the affairs of the Lodge and the sponsors of nearly all constructive movements. The gift by Right Worshipful Brother Daniel Smith was in 1909, and in 1913 our late Brother Albert C. Winsor left to the Lodge by his will the sum of one thousand dollars, which is known as the Winsor Fund. 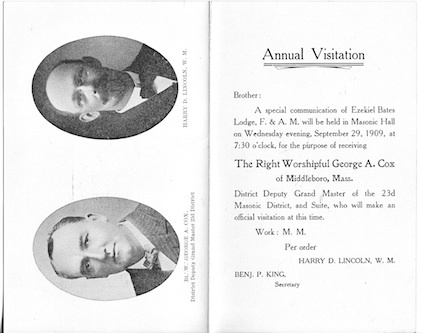 In 1918, after the influenza epidemic, which caused postponement of the official visitation of the Right Worshipful District Deputy Grand Master, Ezekiel Bates Lodge and Bristol Lodge were jointly visited by our Right Worshipful Brother George R. Ellis and the enjoyment of the occasion made us feel well repaid for the postponement. Of the Brethren who formed this Lodge in 1870, nearly all were veterans of our Civil War who fought and risked their lives for the salvation of our country, and we are proud to say that during the late World War the sons of Ezekiel Bates Lodge responded to the call of duty for the salvation of the world. Besides those of us who were considered too old or too infirm to enter the active service, but who tried in our small way at home to bear our share of the burden, thirty-two of our Brethren who were then members of the Lodge went forth and showed their loyalty to the nation and world, and while we are glad to say none of them lost their lives, some of them came back bearing the scars of battle that will remain with them through life. Several who were in the service have since joined our number. Ezekiel Bates Lodge is now enjoying the prosperity that has come from a renewed recognition of the value of Masonic principles, and already in one month of this year has admitted as many members as it had heretofore ever admitted in one year, and probably before this year closes will have added to its number at least double the number it ever has in a similar period before; and we say with confidence that those we have admitted to our ranks are well deserving of the honor. We have obeyed the admonition of the Most Worshipful Grand Master as the representative of the Most Worshipful Grand Lodge to choose carefully, and we are confident that those who are now joining us are of such quality that we can with safety leave the future problems of Ezekiel Bates Lodge in their keeping. The Lodge has been honored by the appointment of three of its members as the District Deputy of the Most Worshipful Grand Master in the old Twenty-third District, viz., Right Worshipful Brother Smith, Right Worshipful Brother Crosby, and Right Worshipful Brother Martin, and in the new Twenty-eighth District, to which the Lodge was assigned at the last redistricting, by the present incumbent. The program for the day gives the names of the charter members, the first officers of the Lodge, and a list of its Past Masters, and the Historic Synopsis gives the dates of the organization of other bodies, Attleboro being the home of all York Rite bodies, as well as the Eastern Star and Grotto, but we would, however, call attention especially to the fact that Adoniram Royal Arch Chapter, which recently celebrated its one hundredth anniversary, was organized in Attleboro in 1816. A picture of Balcolm's Tavern, in which it held its meetings hangs on the wall of our ante-room. This stood on the site of the present Sanford Building. Later Adoniram Chapter removed to Taunton, then to New Bedford, where it is now located. 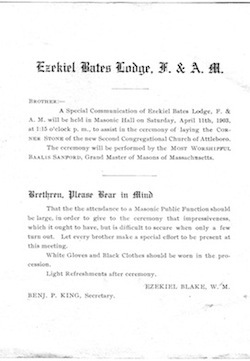 We have confined ourselves to this brief historic outline of Ezekiel Bates Lodge and Blue Lodge Masonry in Attleboro, that all the time possible may be afforded to hear our Most Worshipful Grand Master, by whose presence we are all honored, and who, together with the other officers of the Most Worshipful Grand Lodge, we are proud to welcome on this natal day. By Right Worshipful Benjamin W. Taylor. Many of the members of Ezekiel Bates Lodge have joined since our fiftieth anniversary. Therefore, it seems well that a brief review be given of the early history. At the close of the eighteenth century, in 1797, Bristol Lodge was organized in Norton, chartered by Paul Revere, Grand Master and famous patriot. This Charter has been preserved and is the cherished possession of that lodge. To quote from the history of the first fifty years of Ezekiel Bates Lodge as chronicled by Right Worshipful Ralph C. Estes and read by him at our Golden Jubilee in 1920: "Bristol Lodge, 1812 this lodge moved to Attleboro, East Precinct, and from it's records, it appears members held meetings in their homes and later in Balcom's Tavern, for a number of years. In 1830, it was voted to move to Farnum's Hall, which it is assumed was when the Lodge located in what is now North Attleboro. In 1868, Rt. Wor. Bro. Crosby had his place of business in a small one-story building situated at the corner of Bank and Park Streets in this city, where the Smith Dexter Block, formerly known as the Briggs Block, now stands. This building was known at that time as 'Uncle Tom's Cabin' and in its attic, the only approach to which was by a ladder, through a scuttle, after business of the day was over, Rt. Wor. Bro. Crosby, with, at first, two or three others, and then more, night after night, met and studied and laid the foundations on which Ezekiel Bates Lodge now stands and prospers. In a short time the number interested multiplied so that more spacious quarters were necessary and rooms were hired in a house at the corner of Bank and Peck Streets. The interest increased and consequently application was made to the Most Worshipful Grand Lodge for Dispensation to form a Lodge and through the influence of Worshipful Bro. Ezekiel Bates, a citizen of Attleboro and a Past Master of the Lodge of Saint Andrew of Boston, the Dispensation was granted, the Lodge formed and given the name of Ezekiel Bates, its Patron, who unfortunately did not live to see the Lodge Constituted. He died March, 1871, and the funeral held in the Second Congregational Church, in charge of Bristol and Ezekiel Bates Lodges, and at the close, his remains were given in charge of the Lodge of Saint Andrew, his mother Lodge, and buried in beautiful Mt. Auburn Cemetery. The following were the first officers of Ezekiel Bates Lodge. On June 1, 1876, the hall in the Sturdy Building was leased for fifteen years and the first meeting held there July 5th. A few of us here will recall the lodge-room and the old fashioned stairway to the "banquet" hall—an unfinished room—and the ■ocps to the kitchen that boasted a gas range. A Masonic Fair was held in 1883 in the new Watch Case factory of Brother Joseph M. Bates, who donated the rent, heat and light, the latter, incidentally, being the first electric lights in Attleboro. The fair was a big success, socially and financially. In 1897, June 14th, Bristol Lodge celebrated its 100th anniversary and the records show a large delegation attended from our Lodge; also that Right Worshipful Alfred R. Crosby responded to a toast, "Our Offspring." December 25, 1900, at nine o'clock in the morning, the corner-stone of the Episcopal Church (now Christ Scientist) was laid by Right Worshipful Brothers Alfred R. Crosby, and Edward C. Martin, District Deputy Grand Masters, under authority of Most Worshipful Charles T. Gallagher, Grand Master. Worshipful Master Carl Christensen had urged that because it was the last meeting of Ezekiel Bates Lodge in the Nineteenth Century, there be a good attendance and a very large percentage of the members were present. Their work completed, they left the scene as the Christmas bells rang out from other churches. April 11, 1903, the corner-stone of the Second Congregational Church was laid, the exercises of which will ever linger in our memory. In particular were we impressed by the address of Most Worshipful Baalis Sanford, Grand Master of Masons in Massachusetts, and the regalia worn by him and his Suite gave much color to the assemblage. Worshipful Ezekiel Blake was Master then. In 1904 occurred the laying of the corner-stone of the Bronson Building, at which ceremony Most Worshipful Baalis Sanford again performed the duties in accordance with ancient form and usage. On October 11, 1905, the Masonic Hall was dedicated by Most Worshipful Baalis Sanford, Grand Master, and our Worshipful Master was Worshipful Albert S. Ingraham, who served from 1904 to 1906 inclusive. During World War I, thirty-two of our members served their country to save Democracy. All returned safely, for which we were very thankful. Others who had seen Service joined after the War, so we find the names of forty-eight on that Honor Roll. The 50th anniversary of Ezekiel Bates Lodge was celebrated April 11th and 12th, 1920, and was an occasion long to be remembered. A special service was held on Sunday at the Methodist Church, at which six local ministers, members of the Craft, spoke. On Monday, the 12th, a special communication was opened at 2:45 p.m., when Most Worshipful Arthur D. Prince, beloved by all whom he contacted, was received, with his official family. Dinner was served in the White Church at 6:00 p.m., followed by an exceptionally fine entertainment and concert at the Bates Opera House. Right Worshipful Ralph C. Estes was our District Deputy Grand Master in 1920 and the Historian for that anniversary. Five of our Charter Members were then living—four present at that gala event. From the time Brother William P. Orr was installed as Worshipful Master in November, 1919, until the next installation in November, 1920, sixty-two communications of the Lodge were held. Ice conditions prevailed that winter and crippled transportation so that the Worshipful Master walked home from the meetings to South Attleboro, three and a half miles, TOT several weeks. In that year, the officers of Bristol Lodge made a fraternal visit and worked a degree, and the Past Masters of Ezekiel Bates Lodge assisted twice during the spring. In 1921, Right Worshipful Frederick L. Putnam, District Deputy Grand Master, twice visited our Lodge and made an impressive address on each occasion, directing his remarks to the proper teachings of Masonry, with emphasis on matters of charity in its highest and best sense. 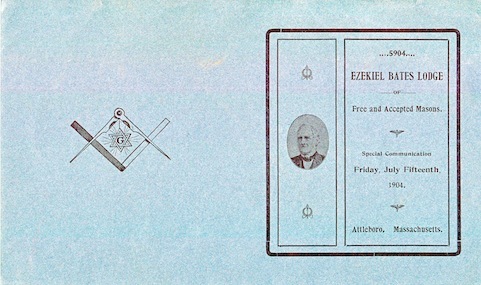 On February 23, 1923, Right Worshipful Alfred R. Crosby, the father of Ezekiel Bates Lodge, officiated as the Worshipful Master, in his usual excellent manner, at a Past Masters' Night. He passed away April 1st, one month later, and was interred with Masonic honors. Two new Lodges were instituted in this jurisdiction in 1924 — Eastern Star Lodge in Rehoboth and Netop, in Seekonk. Our own Right Worshipful Ralph C. Estes was the first Master of Eastern Star Lodge, and in 1924, a delegation from Ezekiel Bates Lodge visited the Lodge and presented a framed copy of their Charter, as a fraternal courtesy. In June, 1927, the Lodge paid final tribute to Worshipful Frank W. Weaver, Treasurer for seventeen years and a Trustee from 1900 to 1906. It was in 1927 also that the 28th Masonic District was divided into two sections — the Taunton 28th and the Attleboro 28th. Later, in 1931, Excelsior Lodge, Franklin, was added to the Attleboro 28th. A special communication was held on June 25, 1927, when we went to North Attleboro for the laying of the corner-stone of the new Temple of Bristol Lodge. It was a very splendid affair, attended by all the Lodges in this section. In May, 1927, Most Worshipful Frank L. Simpson, Grand Master, made a fraternal visit and presented Veteran's Medals to our fifty year members. These were the first to be given in Ezekiel Bates Lodge, but since then, the number presented has reached twenty-one. The significance of the medals has been explained to all — the value of faithful service; the respect in which such service is held, quite apart from rank or position, and the real meaning and purpose of our great Fraternity. Right Worshipful Fred W. Day, in 1928, presented Right Worshipful Ralph C. Estes with a Past District Deputy jewel, as a gift from Ezekiel Bates and Eastern Star Lodges, he having been Deputy in 1919-1920. In 1928 it was voted to change our annual meeting from October to September, and also that year our present efficient Secretary, Brother Charles R. Gage, was first elected to that office. The ten years from 1920 to 1930 were indeed notable ones. The activities in regard to a new home for our Lodge culminated in the dedication of this very beautiful Temple on December 15, 1930, but with this expense, we did not forget our charities, but made our regular annual contributions to the Rainy Day Fund of the Grand Lodge. In 1922, a fund in the Treasurer's hands, known as the furnishing fund, was renamed the Building Fund, and from there on, progress was slow, but gathered strength as time went on. In May, 1926, the Worshipful Master, Robert L. Cooke, appointed the following committee: Brother Harold E. Sweet, Worshipful David E. Makepeace and Brothers Samuel M. Stone, Harry C. Wolfenden and George H. Sykes, who later proved to be the nucleus of the committee which raised the necessary funds and actually superintended the building of the Temple. The committee reported in January, 1928, and recommended the purchase of the Wilmarth property, on which the Temple now stands. In April of that year, the Lodge voted unanimously to buy the property and that the Trustees be instructed to furnish the necessary money from the Building Fund, in their possession. In 1929, by vote of the Lodge, the Worshipful Master was authorized to increase the committee at his discretion. He added to the above mentioned committee the Wardens, Right Worshipful Ralph C. Estes and the Worshipful Master. This committee, in their search for ideas, inspected the Temple at Meriden, Connecticut. Their report on it inspired a large number of members, who made a Sunday trip for first-sand information. They were most favorably impressed, and at the next communication, additional committees were appointed to assist the Building Committee in a campaign for funds to finance the undertaking of building a new Temple. The week of April 10-17, 1929, was one never to be forgotten, ice the enthusiasm that prevailed in the campaign brought in f!5O,O00 in pledges. The members of Hope Chapter, Order of Eastern Star, always cooperative, won fourth place in the friendly rivalry of the five teams of workers, though they solicited only the women members. The success of that week called for a Jubilee Party, which pas held on April 22nd and provided a fitting climax. The cost of the refreshments of that party was donated by the caterer, Robert B. Slater, to the Building Fund. Most Worshipful Walter T. Arnold, a Past Grand Master of Masons in Connecticut, was retained as architect for the build¬ing, and ground was broken September 17, 1929. The laying of the corner-stone, October 26, 1929, was an important milestone in the history of Ezekiel Bates Lodge. Most Worshipful Herbert W. Dean, Grand Master of Masons in Massachusetts, laid the stone, together with other Grand Lodge officers, assisted by Brother Fred E. Briggs, Mayor of Attleboro, Right Worshipful Ralph C. Estes and Worshipful George S. Bliven, Master of the Lodge. There were nineteen Grand Lodge officers present, together with many distinguished guests of the Grand Master and Ezekiel Bates Lodge. Hundreds of Masons from the various Lodges in the double district were there to do honor to the Grand Master and our Lodge. A beautifully etched, copper box containing many articles of Masonic and historical interest to the Craft and times, the gift of Worshipful Charles Thomae, was placed in the corner-stone. During the interval between the laying of this corner-stone and the dedication of the Temple, the Lodge voted confidence and assistance to the Building Committee, and Ezekiel Bates Lodge is deeply indebted to Worshipful George S. Bliven, Right Worshipful Ralph C. Estes, Worshipful Harvey E. Clap and Brothers Samuel M. Stone, Stephen H. Garner and Charles R. Gage, the Construction Committee. They gave countless hours to inspecting the progress of the building and deliberating on ways and means. Brother Harold E. Sweet was always avail¬able for advice and counsel. Right Worshipful Ralph C. Estes was the Treasurer and paid all the bills with meticulous care. December 15, 1930, was a momentous occasion and the first communication in the new Temple opened at 6:00 p.m. A dinner was served in the banquet hall later to over five hundred members. That evening Most Worshipful Herbert W. Dean was received with his Suite and solemnly dedicated this Temple to the purposes of Freemasonry. Many articles of use and value have been presented to the Lodge for the Temple. Among them, one particularly appreciated, is the electric clock, in its especially lovely, hand-carved, gold-leaf frame, in the main lodge-room, a gift of Worshipful Harry H. Williams, a Past Master of Paul Revere Lodge, Brockton. The transfer of lodge property from the Bronson Building to the new Temple was facilitated by the cooperation and assistance of Worshipful Winthrop F. Barden, to whom the Lodge is indebted for many courtesies. In the brief history of twenty-five years in our apartments, on the two upper floors of the building, we older members think back ever so kindly to our social and fraternal good times there. It is a curious fact that we often remember the little things, rather than the big ones, and each of us were impressed by that which we were more easily attracted by, but I wish to speak of the pipe organ, and to say, on good authority, that it was another gift of Right Worshipful Daniel H. Smith. It is the organ now in our Tower lodge-room. It was announced January 21, 1931, that Right Worshipful Robert L. Cooke was installed District Deputy Grand Master for the Attleboro 28th Masonic District at the Feast of St. John in December, 1930. May 11, 1932, a special communication was held for the purpose of observing the anniversary of the birth of our illustrious Brother George Washington, the first President of these United States. July 23, 1932, the Lodge attended the funeral of Brother Joseph Lyman Sweet. He joined the Lodge in 1873; had served as an officer and had always been a loyal member and liberal benefactor of our Lodge. December 21, 1932, Right Worshipful Robert L. Cooke presented Brother Frederick G. Mason with a Veteran's Medal. He was raised in 1880 and was Treasurer from 1881 to 1895. July 15, 1933, it was noted that our Brother, Major John W. Bean, had reached his one hundredth birthday. The following November, we learned of his passing. On September 21, 1938, our annual communication was to have taken place, but fate ruled otherwise, for these parts experienced the worst storm, some said, since that of 1635. The storm began in the afternoon and raged a good part of the night, but luckily, our Temple suffered no serious damage. That hurricane, however, caused considerable property loss to many of our Brethren. The Most Worshipful Grand Master issued a dispensation and the annual meeting was held October 5, 1938. November 17, 1938, the last remaining Charter Member, Brother John W. Luther, died at the age of ninety-six. He is survived by one son, who is with us this afternoon, he having been a member for fifty years. September 18, 1940, a Board of Directors was elected, consisting of twelve members. They replace the Hall Committee and have charge of the actual management of the Temple. This arrangement has improved conditions to a marked degree. August 20, 1943, we were shocked when we learned of the sudden death of Worshipful George Sheffield Bliven. We shall always associate in our memory of him his zeal in our cause and his untiring energy in the building of this Temple. He earned our undying gratitude. In this very rough sketch, embracing a period of one hundred and forty-eight years, in three centuries, much of interest was precluded. Many individuals have been towers of strength in administering the affairs of our Lodge, but their sterling worth and characters are recorded and memories will linger long in our minds. Many of our members are now in the Armed Forces and our prayers are that they may be spared and returned to their families in the not too distant future. The past fourteen years have been difficult ones throughout the world, but by constant effort and meeting situations as they arose with charity and understanding, Ezekiel Bates Lodge has not only survived, but is in a healthy condition and a power for good in the community. To the future members, the heritage of the loyal and unselfish devotion of the members of the past, we now pass to you, on the seventy-fifth anniversary of Ezekiel Bates Lodge. By Right Worshipful Hubert E. J. Berry. In bringing the history up to date, great effort has been made to put into print the pertinent facts of a span of one hundred years. We owe a deep debt of gratitude to the previous historians, Right Worshipful Ralph C. Estes, Right Worshipful Benjamin W. Taylor, Worshipful Benjamin P. King, and Brother Frank Licher. Their untiring and inspiring spirits have presented a fabulous picture of words that brings to the eye and ear a sensation of delight that will bear repetition. Many of the members of Ezekiel Bates Lodge have joined since our fiftieth anniversary. Therefore, it seems that a brief review be given of the early history. The Charter of Ezekiel Bates Lodge bears the date of April 9, 1870. Constituted September, 1871, the Lodge set out on its Masonic mission with twenty-four Charter members, ten of whom were still living in 1895. The Lodge secured new quarters in the Dean Block and from the beginning grew in members and influence. On June 1, 1876, the hall in the Sturdy Building was leased for fifteen years and the first meeting held there July Sth. A Masonic Fair was held in 1883 in the new Watch Case Factory of Brother Joseph M. Bates, who donated the rent, heat and light, the latter, incidentally, being the first electric lights in Attleboro. The fair was a big success, socially and financially. In 1897, June 14th, Bristol Lodge celebrated its 100th anniversary and the records show a large delegation attended from our Lodge; also that Right Worshipful Alfred R. Crosby responded to a toast, "Our Offspring." April 11, 1903, the corner-stone of the Second Congregational Church was laid, the exercise of which will ever linger in our memory. In particular were we impressed by the address of Most Worshipful Baalis Sanford, Grand Master of Masons in Massachusetts. The regalia worn by him and his Suite gave much color to the assemblage. Worshipful Ezekiel Blake was Master then. The 50th anniversary of Ezekiel Bates Lodge was celebrated April 11th and 12th, 1920, and was an occasion long to be remembered. A special service was held on Sunday at the Methodist Church, at which six local ministers, members of the Craft, spoke. On Monday, the 12th, a special communication was opened at 2:45 p.m., when Most Worshipful Arthur D. Prince, beloved by all whom he contacted, was received with his official family. (1920 Mass. 126-138) Dinner was served in the White Church at 6:00 p.m., followed by an exceptionally fine entertainment and concert at the Bates Opera House. Right Worshipful Ralph C. Estes was our District Deputy Grand Master in 1920 and the Historian for that anniversary. Five of our Charter Members were then living — four present at that gala event. On February 23, 1923, Right Worshipful Alfred R. Crosby, the father of Ezekiel Bates Lodge, officiated as the Worshipful Master, in his usual excellent manner, at a Past Masters' Night. He passed away April 1st, one month later, and was buried with Masonic honors. Two new Lodges were instituted in this jurisdiction in 1924 — Eastern Star Lodge in Rehoboth and Netop Lodge in Seekonk. Our own Right Worshipful Ralph C. Estes was the first Master of Eastern Star Lodge, and in 1924, a delegation from Ezekiel Bates Lodge visited the Lodge and presented a framed copy of their Charter, as a fraternal courtesy. In May, 1926, the Worshipful Master, Robert L. Cooke, appointed the following committee: Brother Harold E. Sweet, Worshipful David E. Makepeace, Brother Samuel M. Stone, Brother Harry C. Wolfenden and Brother George H. Sykes, who later proved to be the nucleus of the committee which raised the necessary funds and actually superintended the building of the Temple. The week of April 10-17, 1929 was one never to be forgotten, for the enthusiasm that prevailed in the campaign brought in $150,000 in pledges. Most Worshipful Walter T. Arnold, a Past Grand Master of Masons in Connecticut, was retained as architect for the building, and ground was broken on September 17, 1929. The ten years from 1920 to 1930 were indeed notable ones. The activities in regard to a new home for our Lodge culminated in the dedication of this very beautiful Temple on December 15, 1930. The laying of the corner-stone, October 26, 1929, was an important milestone in the history of Ezekiel Bates Lodge. Most Worshipful Herbert W. Dean, Grand Master of Masons in Massachusetts, laid the stone, together with other Grand Lodge officers, assisted by Brother Fred E. Briggs, Mayor of Attleboro, Right Worshipful Ralph C. Estes and Worshipful George S. Bliven, Master of the Lodge. (1929 Mass. 181-186) There were nineteen Grand Lodge officers present, together with many distinguished guests of the Grand Master and Ezekiel Bates Lodge. Hundreds of Masons from various Lodges in the double district were there to do honor to the Grand Master and our Lodge. A beautifully etched, copper box containing many articles of Masonic and historical interest to the Craft and times, the gift of Worshipful Charles Thomae, was placed in the corner-stone. During the interval between the laying of this corner-stone and the dedication of the Temple, the Lodge voted confidence and assistance to the Building Committee, and Ezekiel Bates Lodge is deeply indebted to Worshipful George S. Bliven, Right Worshipful Ralph C. Estes, Worshipful Harvey E. Clap and Brothers Samuel M. Stone, Stephen H. Garner and Charles R. Gage, the Construction Committee. They gave countless hours to inspecting the progress of the building and deliberating on ways and means. Brother Harold E. Sweet was always available for advice and counsel. Right Worshipful Ralph C. Estes was the Treasurer and paid all the bills with meticulous care. The transfer of Lodge property from the Bronson Building to the new Temple was facilitated by the cooperation and assistance of Worshipful Winthrop F. Barden, to whom the Lodge is indebted for many courtesies. Many articles of use and value have been presented to the Lodge for the Temple. Among them, one particularly appreciated, is the electric clock, in its especially lovely *hand-carved, gold-leaf frame, in the main Lodge-room, a gift of Worshipful Harry H. Williams, a Past Master of Paul Revere Lodge, Brockton. In the brief history of twenty-five years in our apartments on the two upper floors of the building, we older members think back ever so kindly to our social and fraternal good times there. It is a curious fact that we often remember the little things, rather than the big ones, and each of us was impressed by that which we were more easily attracted by. But I wish to speak of the pipe organ, and to say, on good authority, that it was another gift of Right Worshipful Daniel H. Smith. It is the organ now in our Tower lodge room. It was in 1927 also that the 28th Masonic District was divided into two districts — the Taunton 28th and the Attleboro 28th. Later, in 1931, Excelsior Lodge, Franklin, was added to Attleboro 28th District. A Special Communication was held on June 25, 1927, when we went to North Attleboro for the laying of the corner-stone of the new Temple of Bristol Lodge. It was a very splendid affair, attended by all of the Lodges in this section. On September 18, 1940, a Board of Directors was elected, consisting of twelve members. They replace the Hall Committee and have charge of the actual management of the Temple. This arrangement has improved conditions to a marked degree. On August 20, 1943, we were shocked when we learned of the sudden death of Worshipful George Sheffield Bliven. We shall always associate in our memory of him his zeal in our cause and his untiring energy in the building of this Temple. He earned our undying gratitude. Many individuals have been towers of strength in administering the affairs of our Lodge, but their sterling worth and characters are recorded and memories will linger long in our minds. In the past century, Ezekiel Bates Lodge, A. F. & A. M. has been fortunate in the sense that its membership has been composed of men with the capacity to participate in every field of endeavor. Eighty-three men reached a pinnacle of success and served this Lodge as its Master, each one striving in the old tradition to leave his mark on the tracing board. Eight Brothers of this Lodge served the Grand Lodge of Masons of Massachusetts as District Deputy Grand Master with distinction, gracing the station with honor. On September 2, 1958, Rt. Wor. Charles Thomae passed away, and a true Masonic spirit was laid to rest. Countless are the many ways in which he enriched our lives, and his memory will linger long in the hearts and minds of the members of Ezekiel Bates Lodge and his Masonic Brothers throughout the State. On this historic day, let us pause and reflect on the memory of those Brothers of Ezekiel Bates Lodge who shared their Brotherly love and affection for a short span, and who have now passed to the Celestial Lodge above. There have been members who have represented the community in high office, on the state and national level and indeed also today serve faithfully in their field of civic and local activities. We look with pride on the growth of our city and surrounding area and realize how much service has been rendered by men of stature and clear thinking over this past century. The past has presented a cycle of events that ring with the clear note of destiny. It has interwoven into our lives the pattern of success amid the trivial setbacks which surround it. To have shared in that glorious past has been an honor. The present is more exacting in its passion to come to grips with everyday problems. The tempo of modern day living will insist that we strive again with prudence and truth and justice for each success. The ecumenical spirit of the past decade is leading the way to the truth and light of knowledge and understanding among men of every nation, creed and color. What now of the future of this Lodge? What will present itself to hold the basic pattern, to set the tools of craftsmanship, to bring to this new century the wisdom of the old one: Whatever the answers, the clear note of destiny triumphs again in its clarion call to duty, to God, our Country, our neighbors and ourselves. Men of courage and unfailing ability will rise to answer its call. Unswerving loyalty in a Brother's cause will prevail. We shall share in its rich spoils together. In the future, as in the past, Masonry will present its beautiful proportions constantly to the wonder and admiration of all mankind. In its preparation for the future, this Lodge will assume its responsibilities to its fullest extent, extolling each member to extend himself to his widest scope of ability toward its endeavors. Sharing in the enthusiasms of the new century, as our founding Brothers did in the old, answering the cause of these Brothers and to Wor. Ezekiel Bates whose illustrious name this Lodge bears, we accept the challenge of the future as you did the past. The Brothers of today will mark their century with equal strength, their success will be written in their history, continuing to bring light into darkness and to make crooked things straight, shining examples for all to see in the years to come, trusting in God Who in His infinite mercy will guide and protect them. Information on these Brothers was provided by Bro. Bryan Simmons of Ezekiel Bates Lodge in July, 2013. R. W. Wm. Parkman of St. Andrew's Lodge, as D. G. M.
R. W. Wm. W. Baker of Revere Lodge, as S. G. W.
R. W. Edward Stearns of St. Andrew's Lodge, as J. G. W.
W. Wm. F. Davis of St. Andrew's Lodge, as Gr. Marshal. W. Charles J. F. Sherman of St. Andrew's Lodge as Gr. Secretary. Bro. Frank Jones, Adelphi Lodge, as Gr. Tyler. This delegation was principally made up, and the Deputy Grand Lodge was organized, with reference to the circumstance that the Lodge bears the name of the late estimable Brother Ezekiel Bates, Past Master, and at the time of his decease, one of the two eldest members of St. Andrew's Lodge of this city, in which body he served in various capacities and with distinguished fidelity for over half a century. The Charter Members of the new Lodge having assembled and taken their places, the Deputy Grand Lodge was opened in the reception room of the new hall, on the third degree, promptly at 4 o'clk. P. M., and immediately proceeded to constitute them, in due and ancient form, into a regular Lodge, after the forms of the revised ritual in use in this jurisdiction. At the conclusion of these the D. G. Lodge retired, and the preliminary arrangements having been made, it soon after re-entered and proceeded with the Dedication of the new hall; which, it may not be out of place here to say, is an exceedingly neat, chaste and pleasant Lodge room, handsomely furnished and capable of comfortably seating about one hundred Brethren. Attached to it are the necessary ante-rooms, and the usual conveniences. Among the decorations on the walls, we noticed a striking crayon portrait of the beloved Brother whose name it has adopted, — presented to the Lodge by his aged, and we are happy to say, still surviving widow. Daniel H. Smith, W. M.
Alfred R. Crosby, S. W.
Geo. F. Bicknell, J. W.
Edwin L. Crandall, S. D.
Thomas S. Nye, S. S.
At the conclusion of the ceremonies of Installation, the usual charges to the Master, Wardens, and Members of the Lodge were omitted; and, as a substitute for them, others were read, which were written and used on similar occasions in 1795 by the M. W. Paul Revere, of revolutionary memory, when Grand Master of the Grand Lodge of Massachusetts, and which have probably never before been used since the above date. Though exceedingly appropriate and comprehensive, they were particularly well adapted to the present occasion for the reason that the author of them was a member and Past Master of St. Andrew's Lodge. The usual proclamation was then made; after which the new Lodge was addressed at some length by R. W. Bros. Moore and Parkman and the Grand Lodge retired. Among the large number of Brethren present to witness the ceremonies in the evening, were some forty or fifty members of the old Bristol Lodge, located at North Attleboro, and which, we are happy to say, having arisen from among the ruins produced by the reign of Anti-Masonry, is now one of the most flourishing Lodges in the county of Bristol, having some one hundred and thirty active and intelligent members on its roll. The occasion was one of more than ordinary interest, especially to the officiating officers of the Grand Lodge, from the pleasant though mournful reminiscences arising from their former intimate relations the beloved Brother whose memory the new Lodge has honored by adopting his name; and we are very happy to be able to say, that the present condition and future prospects of the Lodge are all that its best friends could desire. The number of Brethren named in its charter is twenty-four, and the number of its initiates during its term of probation is sixteen; all of whom will doubtless immediately enroll themselves among its members, while others have signified their desire to unite themselves with it. It is composed mainly of young and active business men, of the best social position, and in the enjoyment of the respect and confidence of the community in which they live. We heartily tender it our best wishes for its continued prosperity. The following document scan is courtesy of Ezekiel Bates Lodge. A Special Communication of Ezekiel Bates Lodge of Attleboro, Mass. was held Tuesday evening, October 11, at 6 o'clock for the purpose of receiving Most Wor. Baalis Sanford, Grand Master of the Grand Lodge of Massachusetts aud his suite who were present for the purpose of dedicating the new Masonic Apartments. The occasion was one of much interest to large audience of brethren and ladies. This page was last modified on 10 October 2018, at 14:21. This page has been accessed 65,157 times.